Hednesford Town were able to make a real statement of intent to the other sides in the Skrill North following an excellent 3-1 on the road against one of the pre-season title favourites Altrincham, writes Scott Smith. The Pitmen were very much down to the bare bones for what was expected to be one of their toughest tests of the season, with Ben Bailey and Dave Macpherson both starting suspensions whilst Darren Campion missed out through injury. Despite this, the away side made a lively start to the game and were ahead in the eighth minute. A ball into the feet of Neil Harvey was superbly laid off to Robbie Thompson-Brown and he was able to drill his effort low into the corner from 20 yards out. Two minutes later the home side suffered a second blow as they were reduced to ten men with Simon Richman seeing red for a two-footed lunge on Jamey Osborne. This seemingly didn’t affect them too much as in the 14th minute they were level when James Walshaw delightfully headed home at the back post into the far corner of the net. The game was now very much end-to-end as both teams showed their attacking qualities. 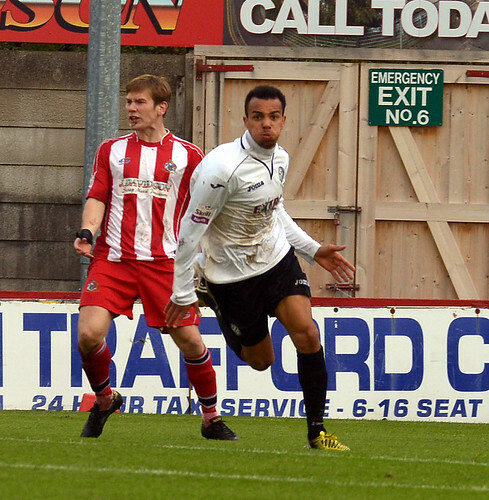 It was from one of these ventures forward that Hednesford regained the lead in the 25th minute. 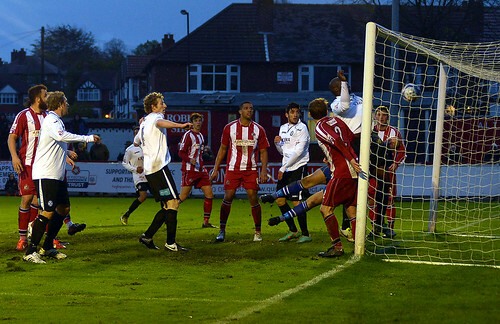 Michael Lennon was felled just outside the 18-yard-box and as the Altrincham goalkeeper and wall were lining up, Elliott Durrell took a quick free kick which beat goalkeeper Stuart Coburn and found the bottom corner of the net. Back came the home side and an almighty scramble inside the six-yard-box saw Town manage to clear the ball from virtually on the goal line. Meanwhile, at the other end, Altrincham’s Jake Moult was perhaps lucky not to be sent off as he scythed down the lively Osborne and only earned a booking in the process. Hednesford were now very much on top with Durrell seeing a free kick tipped over, Osborne missing the target on two separate occasions and Paul McCone seeing a headed effort cleared off the line. 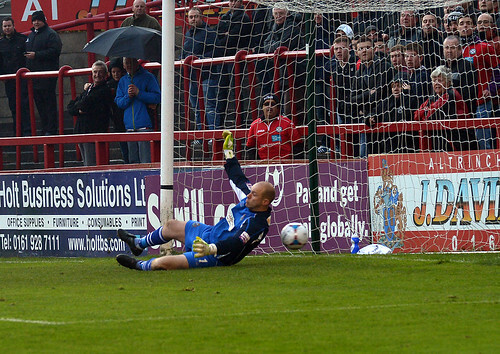 However Dan Crane also had to react quickly to make a smart save down to his left in first half stoppage time. Into the second period and there were appeals for a penalty from the home side in the 51st minute as substitute Kyle Perry went down in the box, however they were waved away by the referee. Apart from this though, the visitors were rarely troubled again by the home side as the second half wore on and they pressed forward in search of a third goal to seal all three points. 17 minutes from time Neil Harvey had a great chance to do so, but he dragged his effort wide when through on goal. 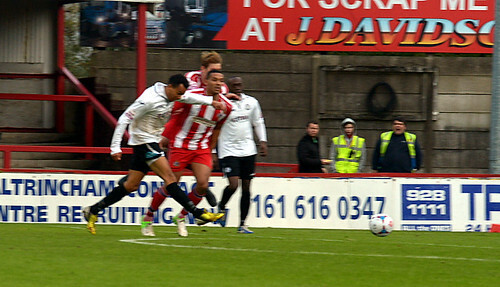 Just three minutes later Francino Francis saw an effort ruled out for an infringement on the goalkeeper from a Town corner. 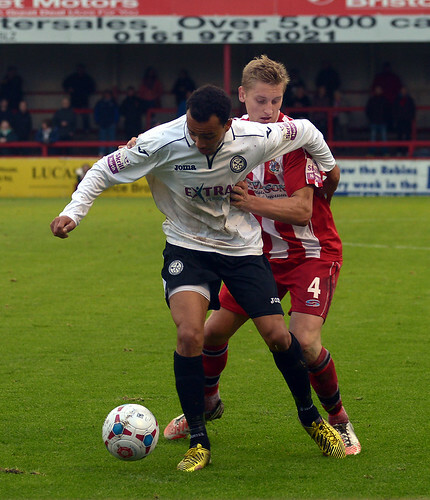 Hednesford’s dominance was eventually rewarded in the 85th minute though when an excellent ball through the middle was brought down by Durrell and he sublimely finished past the advancing Coburn to seal all three points. Rob Smith’s side now sit a point clear at the top of the table and they will be hoping to extend this lead when they host Colwyn Bay at Keys Park on Tuesday 5th November, 7.45pm kick off.